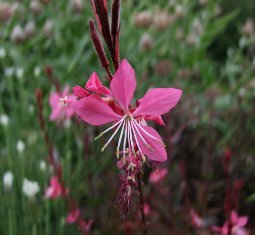 Joy Creek Photo Archive (c) all rights reserved Gaura lindheimeri 'Siskiyou Pink' bears airy tiny butterfly-like flowers in clear pink that contrast well with the red sepals. An introduction from Siskiyou Rare Plant Nursery. June to September. 3 ft. x 2 ft.